Approved by the Council of the Faculty of Natural Sciences of Vilnius University, March 24, 2016. Spatial information is included in many information systems, including the Information System of Geodesy, Cartography and Cadastre. adastral systems usually include a database containing spatially referenced land data, a set of procedures and techniques for systematic collection, updating, processing and distribution of data and a uniform spatial uniform system. This manual is divided into two parts. Both parts are about procedures and techniques for spatial cadastral data collection. The first part includes a more detailed overview of cadastral plans from a surveying point of view. Also the direct techniques (field surveying and GNSS) and COGO methods are discussed as well. 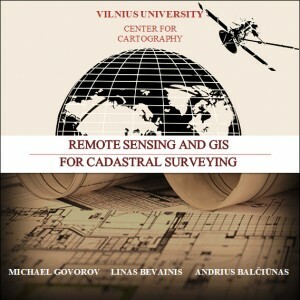 The second part of the manual is dedicated to the indirect techniques or use of Remote Sensing and LiDAR for cadastral survey. Each part of the manual ends with the lab assignments for the students. Following the lab assignment 1, students are introduced with the process of measurements of cadastral land plot by using professional GPS and tacheometer instruments, as well as to demonstrate how ArcGIS software can be used to process field survey measurements and draw a cadastral plan. The aim of the lab assignment 2 is to introduce students with the use remote sensing data to compile and update parcel cadastral plans. The scenario of this assignment includes updating procedures of a land parcel by using an aerial digital orthophoto image (or orthoimage) and LiDAR data without fieldwork. Also, natural and infrastructure objects related to the cadastral data will be derived from orthophoto image and LiDAR data. These tasks will be completed in ArcGIS software. Each lab assignment consists of an introduction, a theoretical justification for the task, task methodological guidance, initial data sets and self-control issues. The manual is dedicated for Erasmus program students, as well as for the courses related with remote sensing, cadastral survey, GIS methods in field survey and so on. Authors are very thankful to Andrei Zubanov, who prepared the initial data for lab assignments.